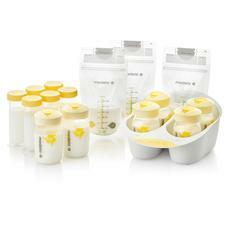 The Breast Milk Storage Solution is the perfect complement to any Medela breast pump. The complete system allows you to safely store, organise, and protect your breast milk throughout your breastfeeding experience. Medela breast milk bottles, labeling lids, and Pump & Save breast milk bags are compatible with all Medela breast pumps and ideal for short or long-term storage. The extra containers are also great to pump into for fast, easy breast milk storage.